Today I'd like to talk to you about a product that's been in my eyelash routine for quite a long time. I'm talking about Mavala Double-Lash Treatment. "DOUBLE-LASH contains proteins which strengthen, cover and protect the lashes which will then become healthy, long and resistant. It is the natural active ingredients which stimulate growth of the lashes, giving them a lovely luxuriant and silky appearance. Strengthens, lengthens and thickens lashes"
Review: I have thin, quite fragile, medium-lenght eyelashes that are almost invisible without mascara! =( So I try to strengthen and thicken them. After trying several lash treatments I've found this one and I'm really liking it! 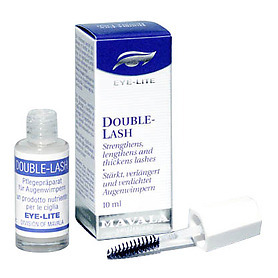 This product costs around 11€ for 10ml and it claims to strengthen, thicken and lengthen lashes. After using it for more than a year now, I can tell you that it does strengthen and thicken them, but I don't see any dramatic difference in their length, however, as my priority was thickening and strengthening, I'm quite satisfied with the results! INCI: Water, Magnesium Aluminium Silicate, Lactococcus Ferment, Butylene Glycol, Propylene Glycol, Metylparaben, Xanthan Gum, Hexamidine Diisethionate, Glycosaminoglycans, Proline, Riboflavin, Chlorphenesin, Phenoxyethanol, 2-Bromo-2-Nitropropane-1-2-Diol, Propylparaben, Sorbic Acid, Butylparaben, Ethylparaben, Isobutylparaben. Overall: I recommend this product because it does what I want without irritating my eyes and it's not an expensive product! It would be perfect if it had a lengthening power too, however I definitely recommend it! That's all for now! I hope this review was helpful! Have you tried any eyelash treatments? Let me know! penso che per il costo il risultato sia soddisfacente, dato che di solito questi prodotti sforano i 60 euro! grazie per l'interessante segnalazione dear! sembra daavero valido! peccato che non abbia mai visto ancora in nessuna profumeria dalle mie parti, anche quelle che hanno lo stand Mavala al completo..
serve molto a rinforzarle, infatti lo uso per quello che hai detto tu, mettendo un sacco di mascara tutti i giorni rischiano di indebolirsi o spezzarsi, questo aiuta!